The Campus is named Srinivasa Vanam as a token of reverence for the grace of Lord Venkateswara, Sri Srinivasa and for the benevolent grant extended by the Tirumala Tirupati Devasthanams for afforestation of the campus. The natural landscape of the campus unlike the level plains of other universities has undulating terrains with green top and exotic beauty which is enchanting and defying description. This idyllic place with lotus filled ponds far from the madding crowds breaths out an inspiring, absorbing fragrance of academic spirit. True to the character of its cherished objectives, the University is located in a tri-lingual junction in the south-western tip of Andhra Pradesh at Kuppam, 8 k.m. from Tamil Nadu and 4 k.m. from Karnataka, a region historically known for its integrated character in terms of language and culture. 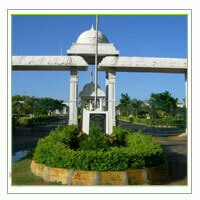 Located in Gudupalle Mandal, the campus has a sprawling, picturesque and serene setting spread over 1093 acres with beautiful greenery and huge and small impressive hillocks presenting a typical rock garden.